Certain fast- and feast-days specially observed in some Jewish communities, in imitation of the national Purim, to commemorate deliverance from some danger which threatened either a whole community or an individual family. At the celebration of these anniversaries a Hebrew megillah (scroll), giving a detailed account of the event commemorated, is read in the synagogue or in the family circle, certain special prayers are recited, and business is suspended for the day. Quite a number of such Purims are known, some of which are enumerated here in alphabetical order. Memorial day established for himself and his family by Abraham Danzig, to be annually observed by fasting on the 15th of Kislew and by feasting on the evening of the same day in commemoration of the explosion of a powder-magazine at Wilna in 1804. By this accident thirty-one lives were lost and many houses destroyed, among them the home of Abraham Danzig, whose family and Abraham himself were all severely wounded, but escaped death (see Danzig, Abraham ben Jehiel). Danzig decreed that on the evening following the 15th of Kislew a meal should be prepared by his family to which Talmudic scholars were to be invited, and alms should be given to the poor. During the feast certain psalms were to be read, and hymns were to be sung to the Almighty for the miraculous escape from death. Steinschneider, Purim und Parodie, in Monatsschrift, xlvii. 473. Celebrated by the Jews of Ancona on the 21st of Ṭebet, and intended to preserve the remembrance of severe earthquakes which occurred in that city on the date in question (Dec. 29, 1690), threatening great disaster. The feast is preceded by a fast on the 20th of Ṭebet; and special prayers are ordained for both days. An account of the event is printed with the prayers in "'Or Boḳer" (p. 47, Venice, 1709; comp. Steinschneider, "Cat. Bodl." col. 2791; idem, in "Monatsschrift," xlvii. 285, No. 13; Zunz, "Ritus," p. 129). Celebrated on the 11th of Iyyar (see Ḥayyim Benveniste, "Keneset ha-Gedolah," § 682; David Amado, "'Ene ha-'Edah," p. 93d, Smyrna, 1866). In 1793 a certain Borghel, a corsair, took possession of Tripoli with his galleys, and drove out the governor, Ali Pasha Karamanli, the Jews becoming the victims of many atrocities. At the end of two years Karamanli recaptured the city, on 29th of Ṭebet, 5553 (= 1793); and the anniversary of this date was celebrated as the Purim Borghel (Franco, "Histoire des Israélites Ottomans," p. 121). In the year 1524 Aḥmed Shaiṭan Pasha, governor of Egypt, imprisoned twelve of the leading Jews of Cairo in order to extort from them a considerable sum of money. Among them was the chief rabbi, David ibn Abi Zimra. This governor—a rebel against his suzerain, Sulaiman the Magnificent, because the latter wished to stamp coins with his own image—excited popular anger by his cruelty. One day he promised to massacre all the Jews in Cairo as soon as he had taken his bath. However, while in the bath he was stabbed by one of his subordinates; and the Jews thus escaped a general massacre. For this reason the Purim of Cairo is annually celebrated on the 28th of Adar (Franco, l.c. pp. 48-49). Observed by the Jews of Candia on the 18th of Tammuz. It is mentioned by Isaac Lampronti ("Paḥad Yiẓḥaḳ," letter ר, fol. 81a, col. 1), who refers to unpublished responsa of Elijah Capsali (1523) as his source, without stating the origin of this festival or the time when it was first instituted. Celebrated by the Jews of Chios in commemoration of an event which occurred, according to some, in 1595, according to others in 1820. The event of 1595 was the descent upon the island of 500 soldiers from a squadron of Ferdinand I., Duke of Tuscany, commanded by Virginio Orsino. The event of 1820 was the revolt of Chios against the Turks during the Greek war of independence. In either event a good Jewish housewife in putting her bread into the oven inadvertently rested the glowing end of her shovel near a cannon, the fuse of which took fire, causing it to be discharged. It should be explained that, as in other places in the Orient, the Jews on the island of Chios lived in a bastion of the fortress. At the sound of the cannon the Turkish soldiers exterminated the enemy. The lady obtained a "berat" granting her certain privileges and the Jews certain favors. El Tempo, Constantinople, March, 1903. 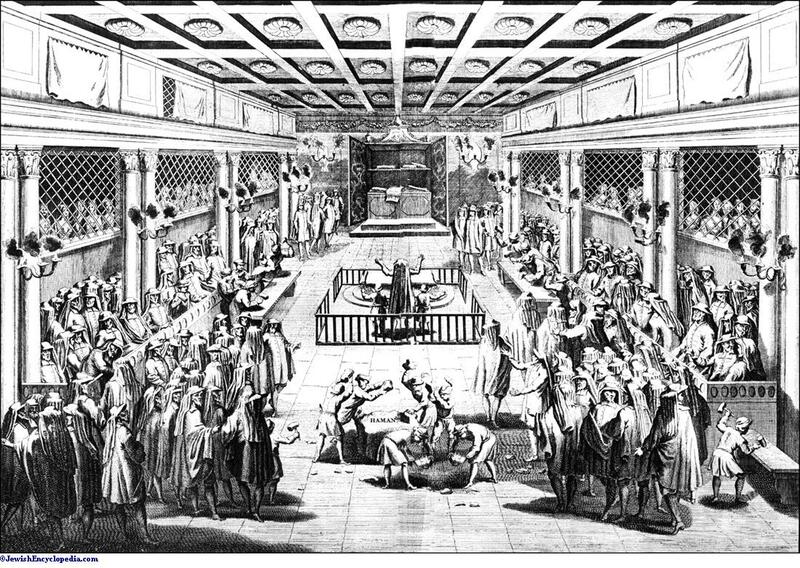 PURIM CEREMONIES IN THE SYNAGOGUE AT AMSTERDAM. In 1578 Sebastian, King of Portugal, landed in Morocco and fought the battle of the "Three Kings," at Alcazar-kebir, with the view of reinstating the dethroned Mulai Ḥamad. The Jews had been in great danger, but they escaped; hence the institution of a Purim and the reading of a megillah on the 1st of Elul. At Tetuan this fête is called "Purim de los Christianos"; at Tangier, "Purim de las Bombas." 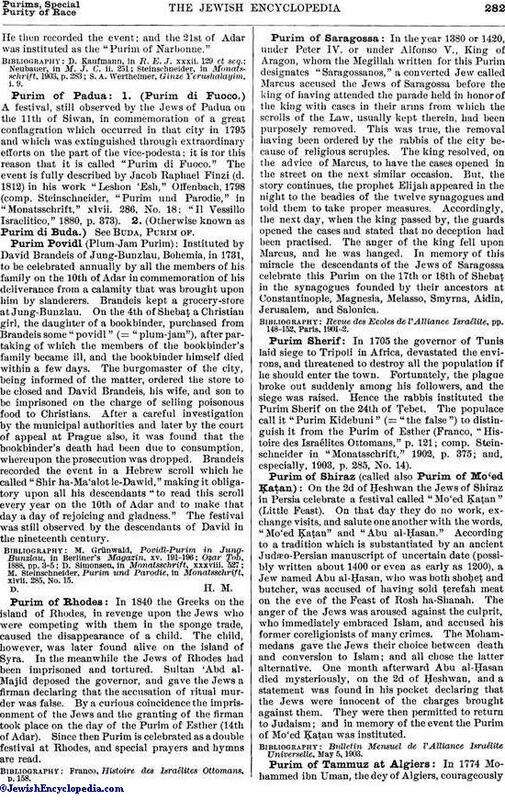 Bulletin Mensuel de l'Alliance Israélite Universelle, 1888 p. 113. In 1541 Charles V., aided by Admiral Andrea Doria, attempted to seize Algiers from Khair al-Din Barbarossa. The Spaniards landed; but their fleet was destroyed by a tempest, due, legend says, to the prayers of R. Solomon Duran, grandson of the celebrated Solomon ben Simon Duran. The Jews thus escaped the fanaticism of the Spaniards; and they instituted this Purim on the 4th of Ḥeshwan. Revue des Ecoles de l'Alliance Israélite Universelle, p. 211. Celebrated by the Jews of Florence on the 27th of Siwan, on which day in 1790 they were saved from a mob by the efforts of the bishop. The festival is preceded by a fast on the 26th of Siwan. The details of the occurrence are related in full by Daniel Terni in a Hebrew pamphlet entitled "Ketab ha-DaṬ," Florence, 1791. See Purim of Padua, No. 1. Festival enjoined on his family by Ḥanok b. Moses Altschul of Prague, to be observed by it annually on the 22d of Ṭebet in remembrance of his deliverance from the hands of a tyrant. In 1623 damask curtains were stolen from the palace of the governor, Prince Lichtenstein, during his absence from Prague. In compliance with an order from the custodian of the palace an announcement was made in all the synagogues of Prague that any one having the stolen goods in his possession should turn them over to the sexton. Thereupon a Jew, Joseph b. Jekuthiel Thein, delivered the curtains to Altschul, at that time sexton of the Meisel Synagogue, Prague, stating that he had bought them from two soldiers. Vice-Governor Count Rudolph Waldstein, who was in charge of the affairs of the provincial government, demanded that the buyer be named and delivered to him for punishment; but as the congregational statutes forbade the naming of receivers of stolen goods who voluntarily had given them up, the sexton refused, and, in consequence, was thrown into prison, an order being issued to hang him on the following day. To save his life Altschul, with the permission of the president of the congregation, revealed the name of the buyer, whereupon Altschul was set free and Joseph Thein was sentenced to the gallows in his stead. All the efforts of influential Jews to effect his release proved futile, but finally through the efforts of a prominent Christian and upon the intercession of the city councilors Count Waldstein released the prisoner on the condition that the congregation pay a fine of 10,000 florins. In order to humiliate the Jews he further ordered that this money, divided into ten equal parts, be paid in silver coin and carried in linen bags by ten prominent Jews escorted by soldiers through the streets of Prague to the city hall. Altschul recorded the event in a scroll entitled "Megillat Pure ha-Ḳela'im" ("The Scroll of the Purim of the Curtains"), and made it obligatory upon all his descendants to read the scroll annually on the 22d of Ṭebet, on which day he was liberated, and to observe the day by "feasting and giving thanks to God for his salvation." The event was made the subject of a novel by Matthias Kisch. Steinschneider, Purim und Parodie, xlvii. 284. In 1786 about 5,000 mountain brigands ("tokatchikli") in trying to pillage the town of Gumeldjina, near Adrianople, entered the bastion inhabited by the Jews and terrorized them. The governor succeeded in driving off the brigands, but the Jews were accused of having conspired with them. The Jews energetically protested and proved their innocence. In memory of this escape from a double misfortune the 22d of Elul was ordained by the rabbis as a local Purim. Yosif Da'at, Adrianople, Dec. 20, 1888. Instituted by Rabbi Jonathan b. Jacob of Fulda on the 17th of Tammuz to commemorate a calamity that was averted from his congregation. He himself called this festival "Purim Sheli" (= "My Purim"). idem, Geschichtliche Literatur der Juden, p. 87, § 94. Celebrated by the Jews of Lepanto on the 11th of Ṭebet in commemoration of a miraculous escape of the Jews from danger. It is mentioned in the responsa of Moses b. Isaac Alashkar (Sabbionetta, 1554), No. 49 (comp. Simonsen in "Monatsschrift," xxxviii. 526). Celebrated on the 21st of Adar by the Jews of Narbonne in commemoration of an event which took place there on that day in 1236. The facts, as recorded by R. Meïr b. Isaac of Narbonne, are as follows: In a quarrel between a Jew of Narbonne and a Christian fisherman the former dealt the latter a heavy blow from which he died. This aroused the wrath of the Christian populace, which attacked the whole Jewish community and started a riot in the Jewish quarter, pillaging first the house of the above-mentioned Rabbi Meïr and carrying away his entire library. Fortunately Don Aymeric, the governor of Narbonne, appeared on the scene with a force of soldiers for the protection of the Jews. The ṁob was soon dispersed, order was reestablished, and even the spoil which had been taken from R. Meïr was returned to him.He then recorded the event; and the 21st of Adar was instituted as the "Purim of Narbonne." S. A. Wertheimer, Ginze Yerushalayim, i. 9. 1. (Purim di Fuoco.) 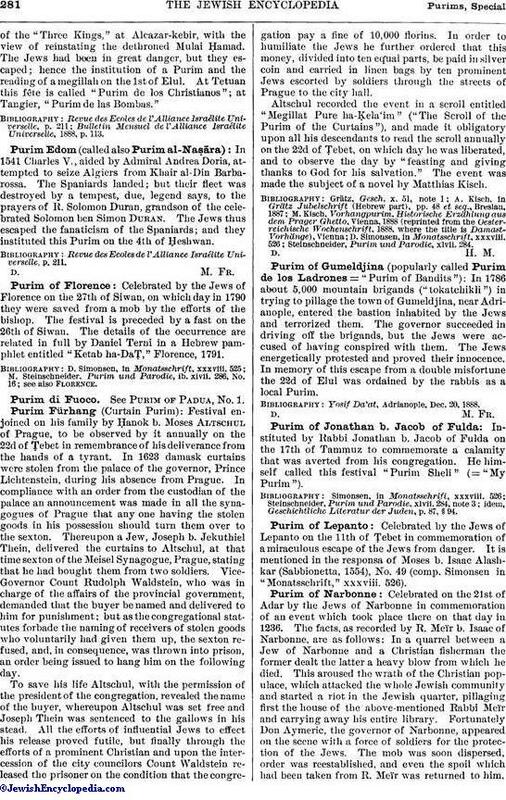 A festival, still observed by the Jews of Padua on the 11th of Siwan, in commemoration of a great conflagration which occurred in that city in 1795 and which was extinguished through extraordinary efforts on the part of the vice-podesta; it is for this reason that it is called "Purim di Fuoco." The event is fully described by Jacob Raphael Finzi (d. 1812) in his work "Leshon 'Esh," Offenbach, 1798 (comp. Steinschneider, "Purim und Parodie," in "Monatsschrift," xlvii. 286, No. 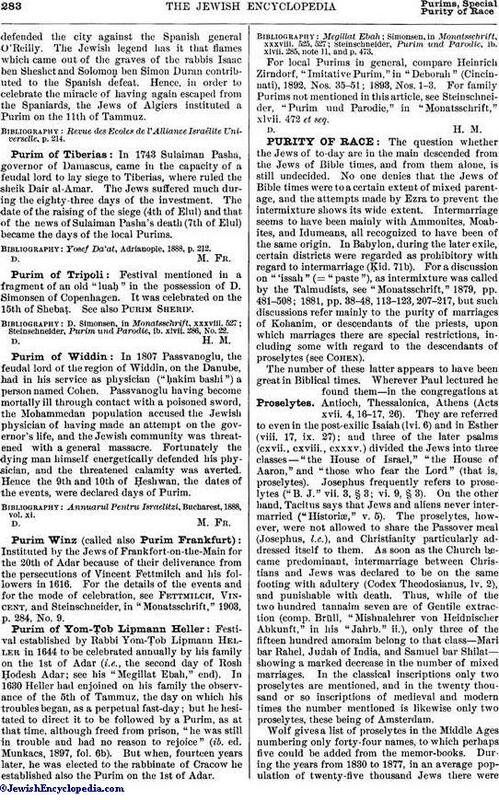 18: "Il Vessillo Israelitico," 1880, p. 373). 2. (Otherwise known as Purim di Buda.) See Buda, Purim of. Instituted by David Brandeis of Jung-Bunzlau, Bohemia, in 1731, to be celebrated annually by all the members of his family on the 10th of Adar in commemoration of his deliverance from a calamity that was brought upon him by slanderers. Brandeis kept a grocery-store at Jung-Bunzlau. On the 4th of Shebaṭ a Christian girl, the daughter of a bookbinder, purchased from Brandeis some "povidl" (= "plum-jam"), after partaking of which the members of the bookbinder's family became ill, and the bookbinder himself died within a few days. The burgomaster of the city, being informed of the matter, ordered the store to be closed and David Brandeis, his wife, and son to be imprisoned on the charge of selling poisonous food to Christians. After a careful investigation by the municipal authorities and later by the court of appeal at Prague also, it was found that the bookbinder's death had been due to consumption, whereupon the prosecution was dropped. Brandeis recorded the event in a Hebrew scroll which he called "Shir ha-Ma'alot le-Dawid," making it obligatory upon all his descendants "to read this scroll every year on the 10th of Adar and to make that day a day of rejoicing and gladness." The festival was still observed by the descendants of David in the nineteenth century. M. Steinschneider, Purim und Parodie, in Monatsschrift, xlvii. 285, No. 15. In 1840 the Greeks on the island of Rhodes, in revenge upon the Jews who were competing with them in the sponge trade, caused the disappearance of a child. The child, however, was later found alive on the island of Syra. In the meanwhile the Jews of Rhodes had been imprisoned and tortured. Sultan 'Abd al-Majid deposed the governor, and gave the Jews a firman declaring that the accusation of ritual murder was false. By a curious coincidence the imprisonment of the Jews and the granting of the firman took place on the day of the Purim of Esther (14th of Adar). Since then Purim is celebrated as a double festival at Rhodes, and special prayers and hymns are read. Franco, Histoire des Israélites Ottomans, p. 158. In the year 1380 or 1420, under Peter IV. or under Alfonso V., King of Aragon, whom the Megillah written for this Purim designates "Saragossanos," a converted Jew called Marcus accused the Jews of Saragossa before the king of having attended the parade held in honor of the king with cases in their arms from which the scrolls of the Law, usually kept therein, had been purposely removed. This was true, the removal having been ordered by the rabbis of the city because of religious scruples. The king resolved, on the advice of Marcus, to have the cases opened in the street on the next similar occasion. But, the story continues, the prophet Elijah appeared in the night to the beadles of the twelve synagogues and told them to take proper measures. Accordingly, the next day, when the king passed by, the guards opened the cases and stated that no deception had been practised. The anger of the king fell upon Marcus, and he was hanged. In memory of this miracle the descendants of the Jews of Saragossa celebrate this Purim on the 17th or 18th of Shebaṭ in the synagogues founded by their ancestors at Constantinople, Magnesia, Melasso, Smyrna, Aldin, Jerusalem, and Salonica. Revue des Ecoles de l'Alliance Israélite, pp. 148-152, Paris, 1901-2. In 1705 the governor of Tunis laid siege to Tripoli in Africa, devastated the environs, and threatened to destroy all the population if he should enter the town. Fortunately, the plague broke out suddenly among his followers, and the siege was raised. Hence the rabbis instituted the Purim Sherif on the 24th of Ṭebet. The populace call it "Purim Kidebuni" (= "the false") to distinguish it from the Purim of Esther (Franco, "Histoire des Israélites Ottomans," p. 121; comp. Steinschneider in "Monatsschrift," 1902, p. 375; and, especially, 1903, p. 285, No. 14). On the 2d of Ḥeshwan the Jews of Shiraz in Persia celebrate a festival called "Mo'ed Ḳaṭan" (Little Feast). On that day they do no work, exchange visits, and salute one another with the words, "Mo'ed Ḳaṭan" and "Abu al-Ḥasan." According to a tradition which is substantiated by an ancient Judæo-Persian manuscript of uncertain date (possibly written about 1400 or even as early as 1200), a Jew named Abu al-Ḥasan, who was both shoḥeṭ and butcher, was accused of having sold ṭerefah meat on the eve of the Feast of Rosh ha-Shanah. The anger of the Jews was aroused against the culprit, who immediately embraced Islam, and accused his former coreligionists of many crimes. The Mohammedans gave the Jews their choice between death and conversion to Islam; and all chose the latter alternative. One month afterward Abu al-Ḥasan died mysteriously, on the 2d of Ḥeshwan, and a statement was found in his pocket declaring that the Jews were innocent of the charges brought against them. They were then permitted to return to Judaism; and in memory of the event the Purim of Mo'ed Ḳaṭan was instituted. Bulletin Mensuel de l'Alliance Israélite Universelle, May 5, 1903. In 1774 Mohammed ibn Uman, the dey of Algiers, courageouslydefended the city against the Spanish general O'Reilly. The Jewish legend has it that flames which came out of the graves of the rabbis Isaac ben Sheshet and Solomon ben Simon Duran contributed to the Spanish defeat. Hence, in order to celebrate the miracle of having again escaped from the Spaniards, the Jews of Algiers instituted a Purim on the 11th of Tammuz. Revue des Ecoles de l'Alliance Israélite Universelle, p. 214. In 1743 Sulaiman Pasha, governor of Damascus, came in the capacity of a feudal lord to lay siege to Tiberias, where ruled the sheik Dair al-Amar. The Jews suffered much during the eighty-three days of the investment. The date of the raising of the siege (4th of Elul) and that of the news of Sulaiman Pasha's death (7th of Elul) became the days of the local Purims. Yosef Da'at, Adrianople, 1888, p. 212. Festival mentioned in a fragment of an old "luaḥ" in the possession of D. Simonsen of Copenhagen. It was celebrated on the 15th of Shebaṭ. See also Purim Sherif. Steinschneider, Purim und Parodie, ib. xlvii. 286, No. 22. In 1807 Passvanoglu, the feudal lord of the region of Widdin, on the Danube, had in his service as physician ("ḥakim bashi") a person named Cohen. Passvanoglu having become mortally ill through contact with a poisoned sword, the Mohammedan population accused the Jewish physician of having made an attempt on the governor's life, and the Jewish community was threatened with a general massacre. Fortunately the dying man himself energetically defended his physician, and the threatened calamity was averted. Hence the 9th and 10th of Ḥeshwan, the dates of the events, were declared days of Purim. Annuarul Pentru Israelitzi, Bucharest, 1888, vol. xi. Instituted by the Jews of Frankfort-on-the-Main for the 20th of Adar because of their deliverance from the persecutions of Vincent Fettmilch and his followers in 1616. For the details of the events and for the mode of celebration, see Fettmilch, Vincent, and Steinschneider, in "Monatsschrift," 1903, p. 284, No. 9. Festival established by Rabbi Yom-Ṭob Lipmann Heller in 1644 to be celebrated annually by his family on the 1st of Adar (i.e., the second day of Rosh Ḥodesh Adar; see his "Megillat Ebah," end). In 1630 Heller had enjoined on his family the observance of the 5th of Tammuz, the day on which his troubles began, as a perpetual fast-day; but he hesitated to direct it to be followed by a Purim, as at that time, although freed from prison, "he was still in trouble and had no reason to rejoice" (ib. ed. Munkacs, 1897, fol. 6b). But when, fourteen years later, he was elected to the rabbinate of Cracow he established also the Purim on the 1st of Adar. Steinschneider, Purim und Parodie, ib. xlvii. 285, note 11, and p. 473. 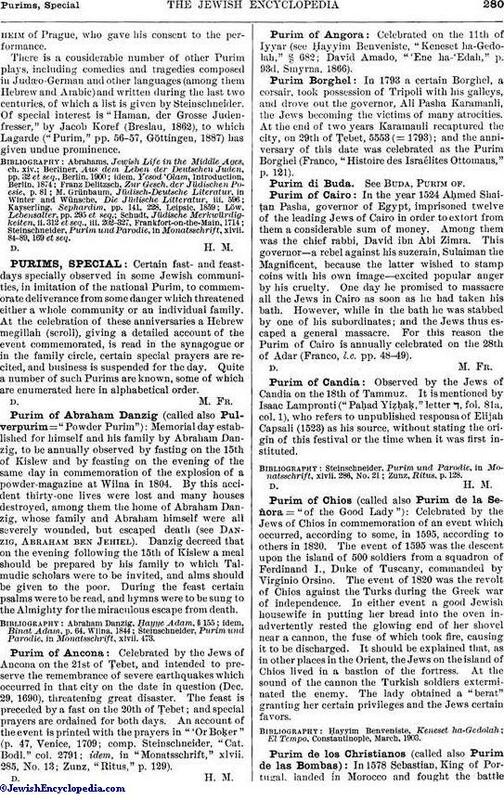 For local Purims in general, compare Heinrich Zirndorf, "Imitative Purim," in "Deborah" (Cincinnati), 1892, Nos. 35-51; 1893, Nos. 1-3. For family Purims not mentioned in this article, see Steinschneider, "Purim und Parodie," in "Monatsschrift," xlvii. 472 et seq.